Working for Professional Grade Construction was a death sentence for Winston Gillette. Written by Jessica Acee, Board member of the Workers Justice Project. A vigil was held September 25th for Winston Gillette, a construction worker killed 2 weeks ago when the roof of the building he was working on caved in on him. That building, located at 227 Carlton Ave in Brooklyn’s Fort Green neighborhood, was under construction by Professional Grade Construction company. To date, the company has not issued an apology. Brooklyn, NY – On Monday, September 24, 2012 at 6PM, the Workers Justice Project (WJP) along with other worker centers will gather in front of 227 Carlton Ave. Fort Greene, Brooklyn to strongly condemn dreadful working conditions and labor exploitation in residential construction sites in and around New York City, where low-income men and women are employed. Winston Gillett, 62, was crushed to death after a roof collapsed at one of the townhouses. Gillett was working at the Carlton Mews Townhouse project, which was being built by Professional Grade Construction Corp. However, this year many other workers have also died while being crushed under the weight of thousands of pounds of building materials, being buried alive in a trench, or falling to their death from a scaffold with no harness. In New York City residential construction, these types of incidents are so common that the contractors, building owners and developers, and the city do not pause for breath before ordering workers to climb back on the scaffolds. They all know that low and sometimes no wages, complete disregard for health and safety protections, and treating workers like they are disposable are part of a regular day’s work in residential construction. Meanwhile, residential construction spending increased to $2.9 billion in 2011 and is expected to climb to $4.8 billion in 2012, benefiting immensely from this exploitation. Join us on Monday, September 24, 2012, 6 p.m. to raise our voices against exploitation in residential construction and to ensure that the deaths of Winston Gillette, Santos Garcia, Adrien Zamora, and many other workers in the construction industry result in real protections for workers in the future. How will the new law impact you and your neighbors? What can you do about it? And with that, a new phase of the migrant rights movement, based on an age-old model of community organizing, was born. clinic Helvetica, sans-serif; text-align: left;”>The migrant rights movement in this country is about to enter a new phase and every person, no matter their position, will have to decide how they will relate to it. While many are waiting to see the decision of the Supreme Court related to the Department of Justice’s SB1070 case, a human rights crisis of epic proportions is already roiling in Arizona. The status quo we face now and the results of even the best possible decision from the Supreme Court still represent a steady march toward anti-immigrant attrition that the state has constructed over years. First we faced efforts to restrict our ability to function in society: drivers’ license bans, denial of social services, and English only rules. Then they built ways to humiliate and dehumanize us through Sheriff Arpaio’s outdoor jails and Florence’s expanding penal colonies. 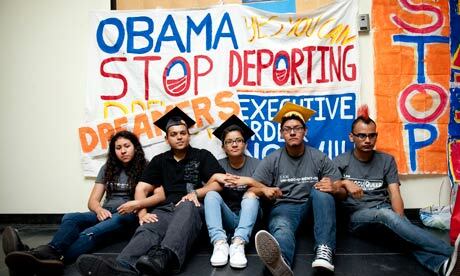 In a major announcement Friday 15 June, the Obama administration declared it will stop deporting eligible undocumented youth and grant them work permits. I was immediately elated to hear the news that could change the lives of family members, friends, and thousands of young people who face the threat of deportation every day. Yet, as the initial shock wears off, I can’t ignore a rising sense of skepticism in response to the president’s nakedly political move in an election year. Nor can I ignore his record so far.